Welcome back for another edition of Monday Montage! The Tags and Labels Framelits make it quick and easy to create simple cards. The set comes with 3 sizes of tags and labels and 3 tags and labels that can be used as mats behind each size. This card also features the Go Wild DSP. Welcome to the Monday Montage Blog Hop. Today I have a quick card to share with you. 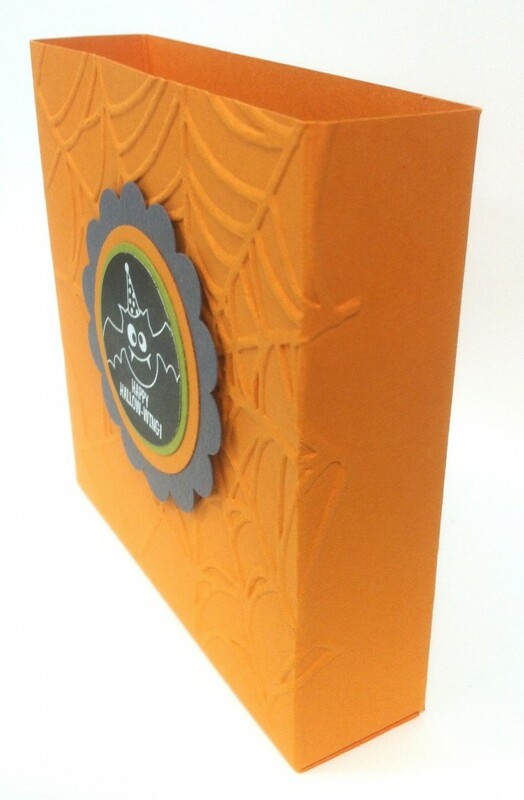 I wasn’t able to get a very good picture, so it really doesn’t show just how pretty the embossing is. I used the Apothecary Art stamp set, and then I embossed it in gold embossing powder. It was cut using the Label Framelits. Then I water colored the flowers in Bermuda Bay and Rich Razzleberry. 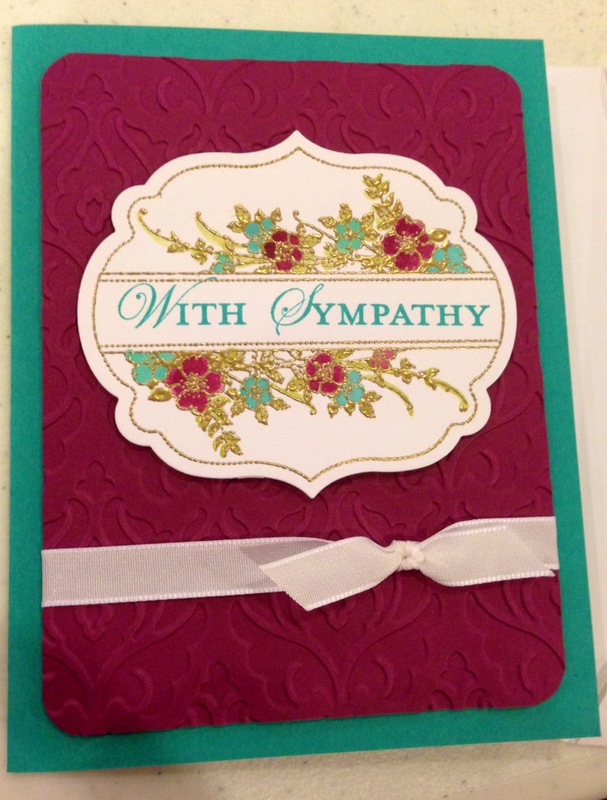 The “With Sympathy” is from the stamp set called Loving Thoughts. Thanks for joining me, now be sure to continue on the hop by clicking back or next. 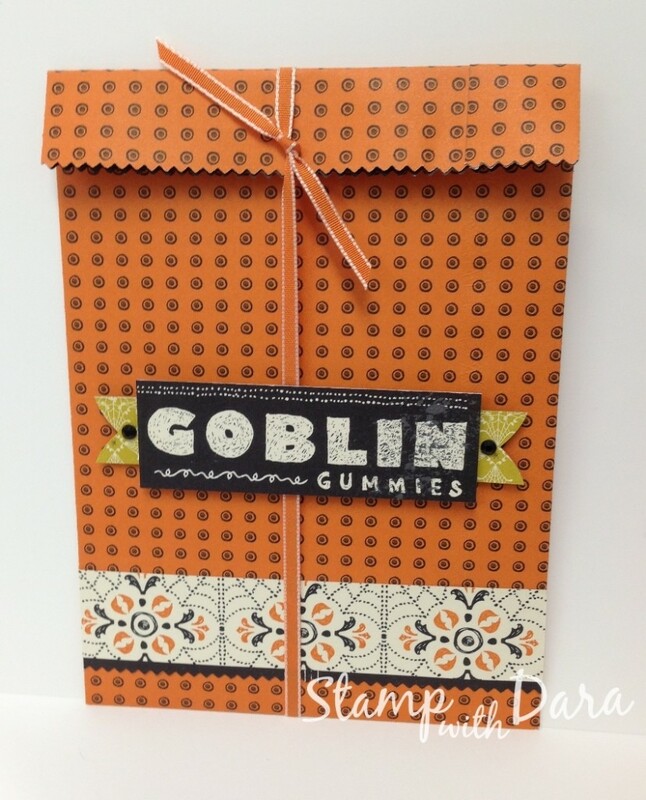 Today I have some cute Halloween themed treat bags to show you. 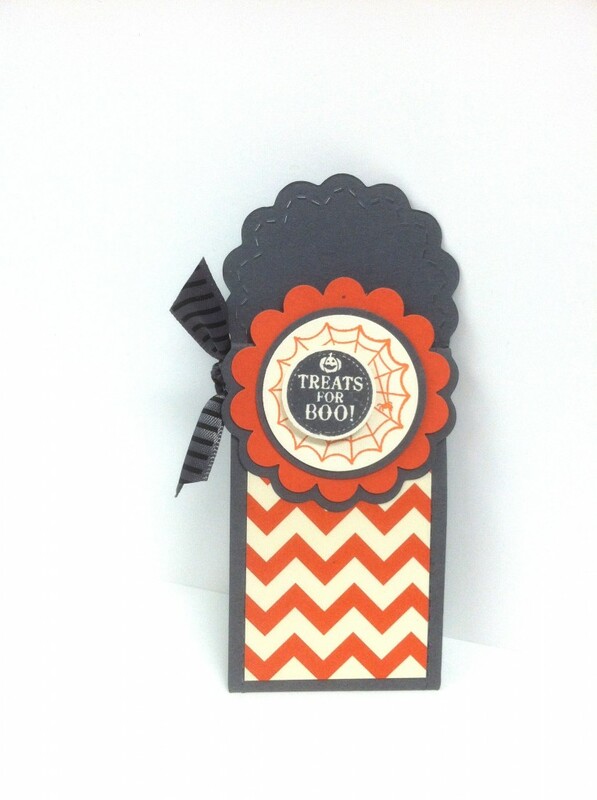 I don’t know if you’ve seen those adorable chevron tag a bag gift bags in the catalog, but they are awesome. 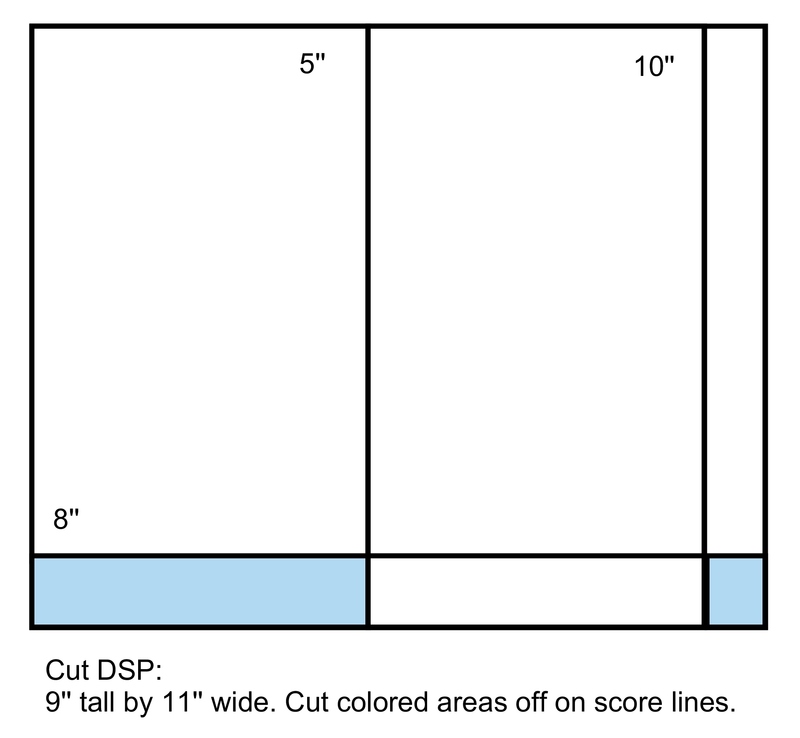 Although I love the chevron bags, I chose to create my own template to make similar bags out of DSP. Once you have a template, they come together pretty quickly. This is what they look like when they are assembled and closed. The tag on this bag was created using the Chalk Talk Framelits, Tags Four You stamp set, and coordinating Label Bracket punch. On this bag I cut the “Goblin Gummies” piece from one of the sheets of DSP. I also chose to close this bag with the Witches’ Brew Designer Washi Tape. 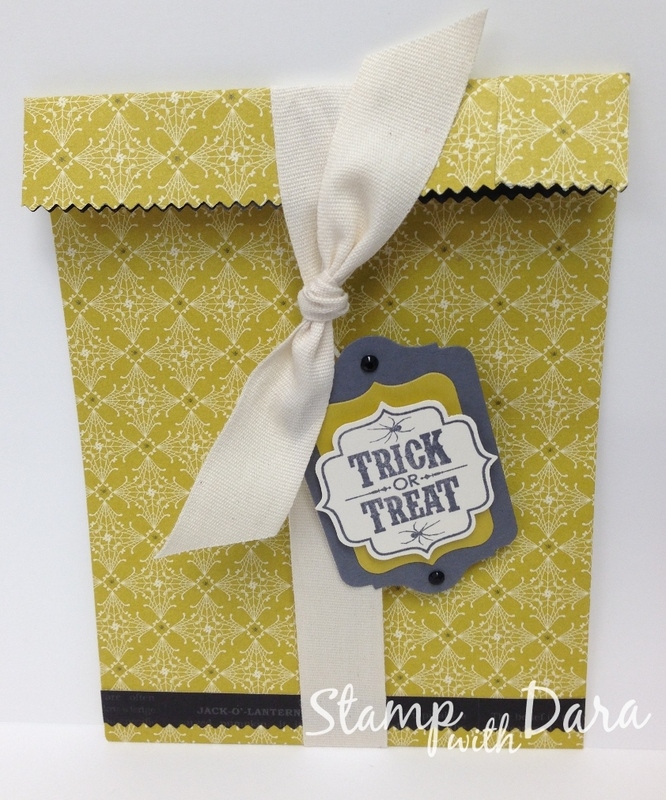 I made the tag on this one using an embossing folder to add some texture, and then I spritzed it with Vanilla Shimmer Smooch Spritz. 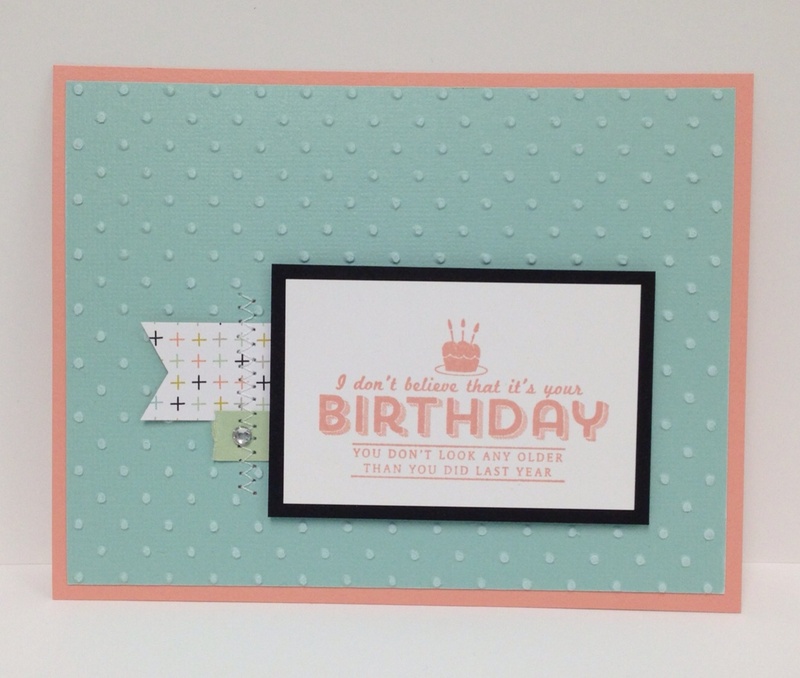 The saying is from the Teeny Tiny Wishes stamp set. I used the Witches’ Brew Designer Series Paper to make the bags. Once I assembled the bags I ran it through the big shot using the Finishing Touches Edgelits to give the top edge a zigzag border. Thanks for stopping by! I hope you enjoyed my Halloween treat bags. Don’t forget to click either the back button or the next button to continue the hop. 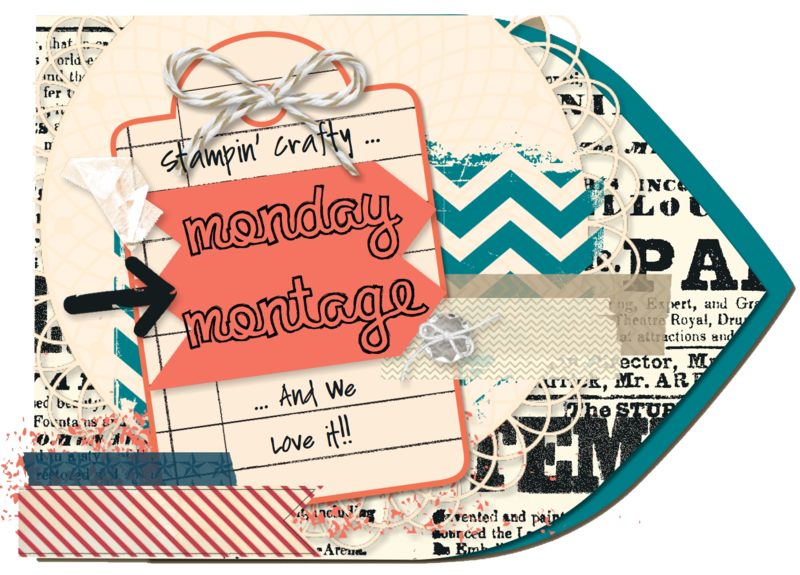 Thanks for joining me for another round of the Monday Montage Blog Hop. I’m so excited to share this card with you today. It features the new Thinlits Card Dies. I fell in love with these the first time I used them! 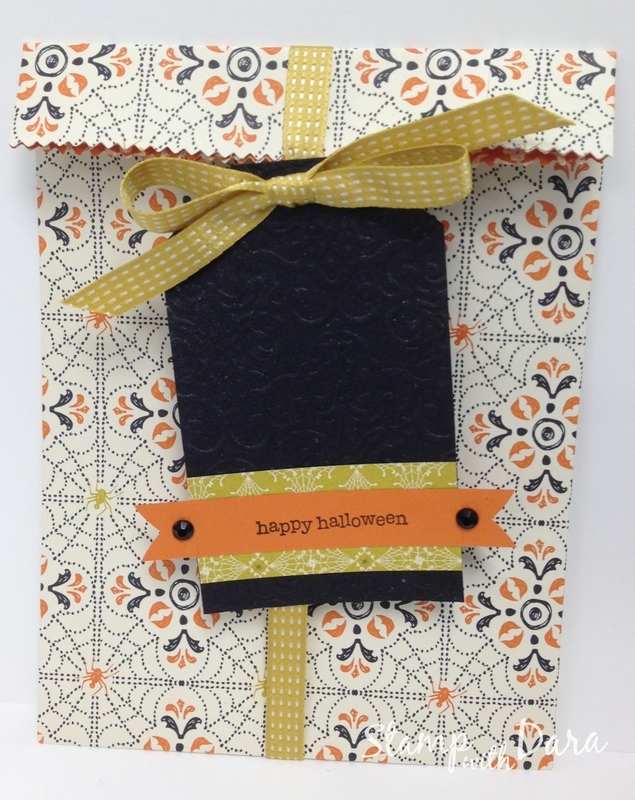 They are super quick and easy, but you wouldn’t know by just looking at the finished card. 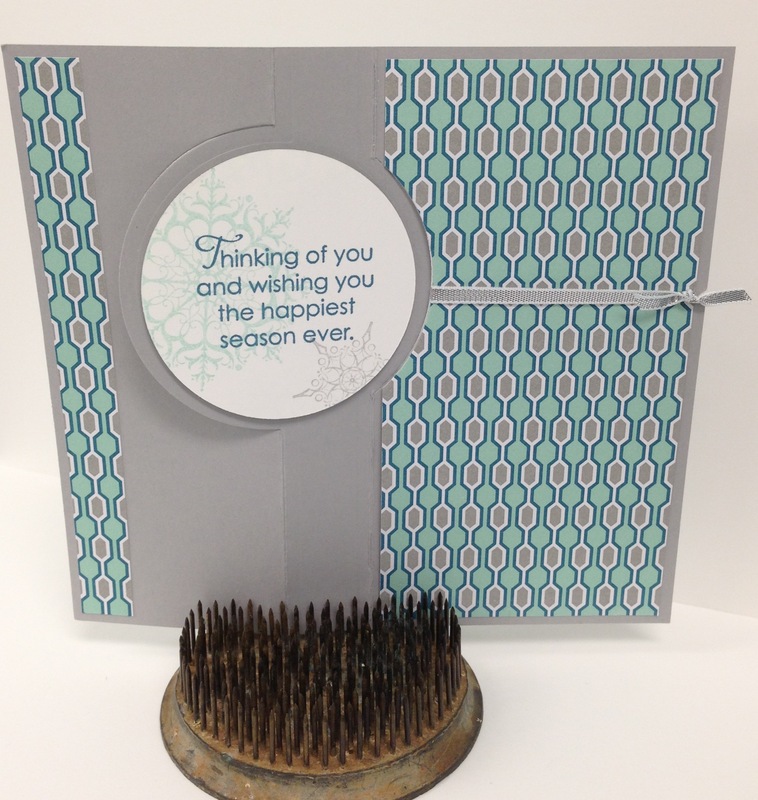 In addition to the Thinlets Card Dies, I used the Snowflake Soiree stamp set. 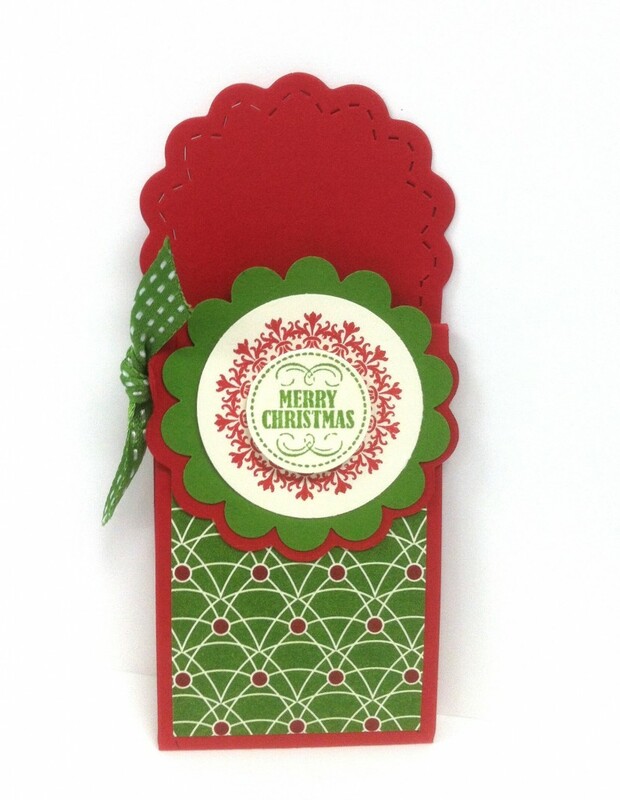 The greeting and sentiment are from the More Merry Messages stamp set. If you are wondering why you can’t seem to find these sets in the catalogs, it is because they are two of the few carry over sets only shown in the online store. 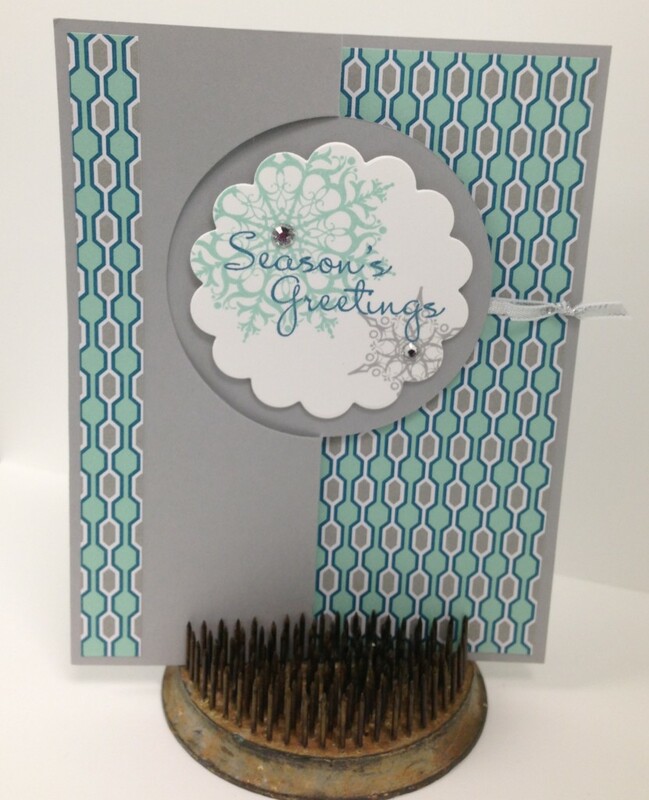 I also used the new silver ribbon, and Winter Frost DSP stack from the Holiday catalog. Now be sure to click either the back button or the next button in order to see everyone’s fabulous projects. 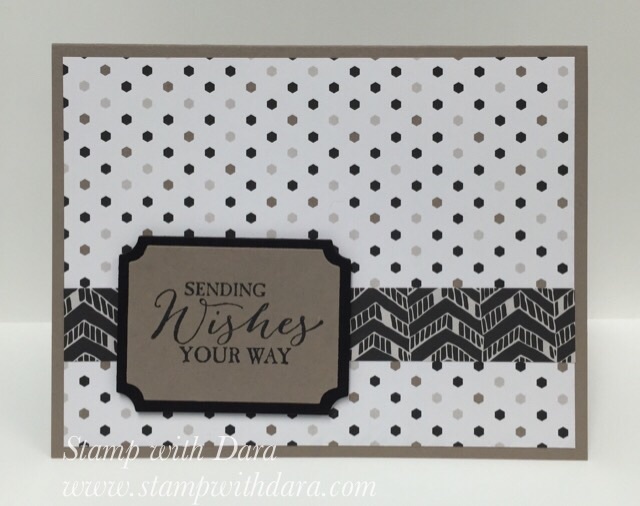 Today I’m showing you how to take a simple card and add a few additional steps to create a slightly more detailed card. Although this is still a clean and simple card, there are a few added details that really make the card pop. 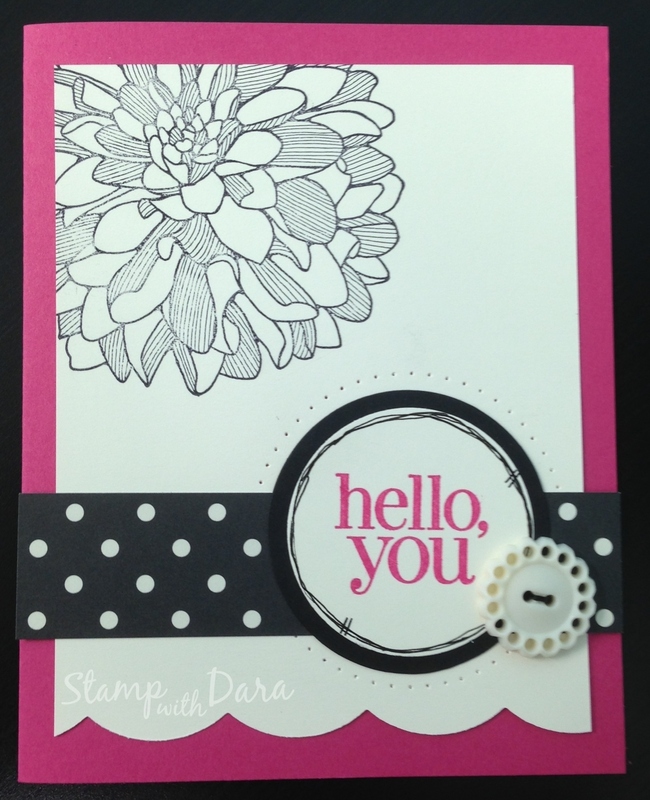 For this card I simply stamped the vanilla card stock with the dahlia image from the Regarding Dahlias stamp set in Basic Black ink. 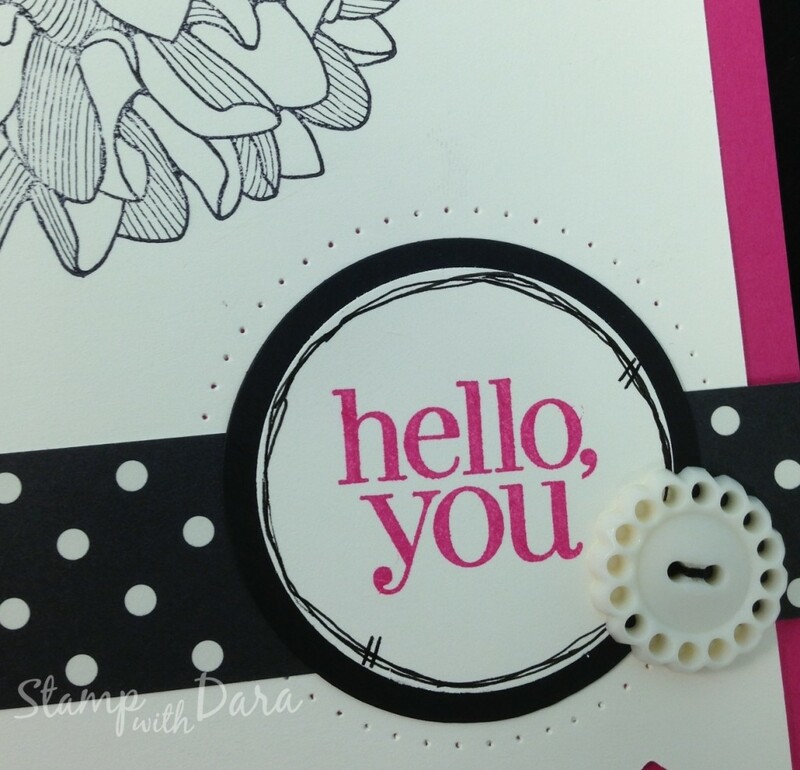 Then I punched out hello you with the 1 3/4” circle punch, and I used the fine tip end of the basic black marker to doodle around the edge of the circle. These few details really change the look of the card. 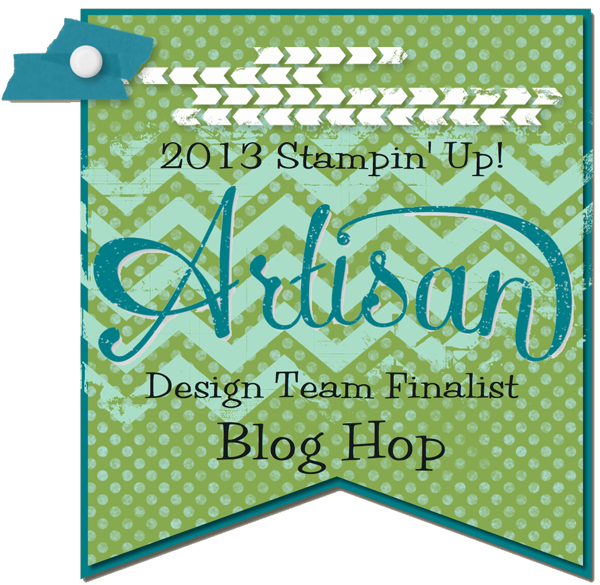 Welcome to Day 9 of the Artisan Finalist Blog Hop. Today I’m showing the last card entry I used for the Artisan Contest. 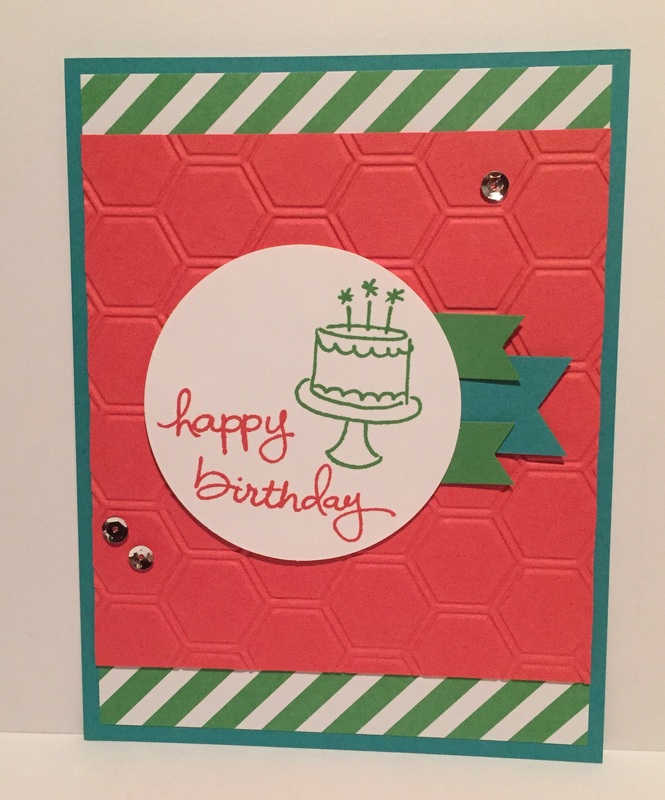 I started by dry embossing the edge on the front of the card, and I added the strips of DSP before cutting out the front window. Then I closed the card and decided where I wanted to place the butterflies and greeting. I stamped them in Versamark, and then I heat embossed in Whisper White embossing powder. 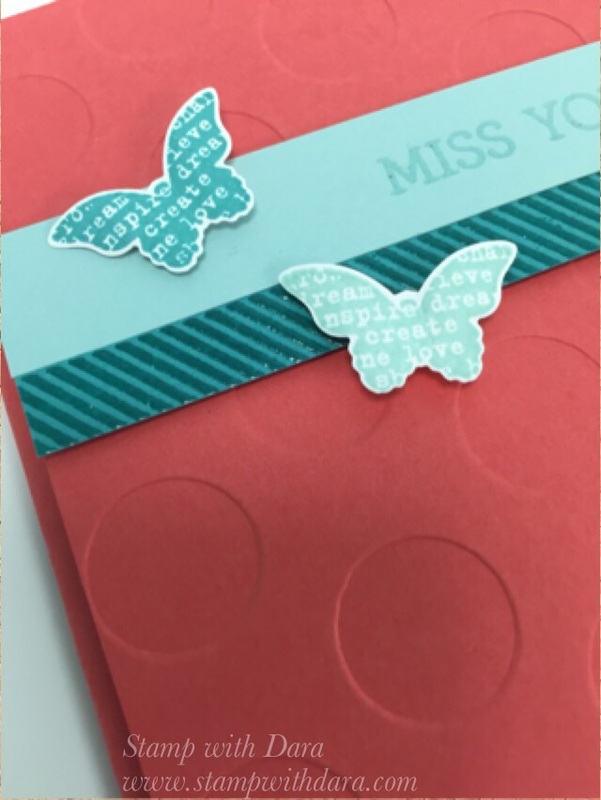 I did the emboss resist technique by using different inks with a sponge around the embossed image so that the butterflies show up. 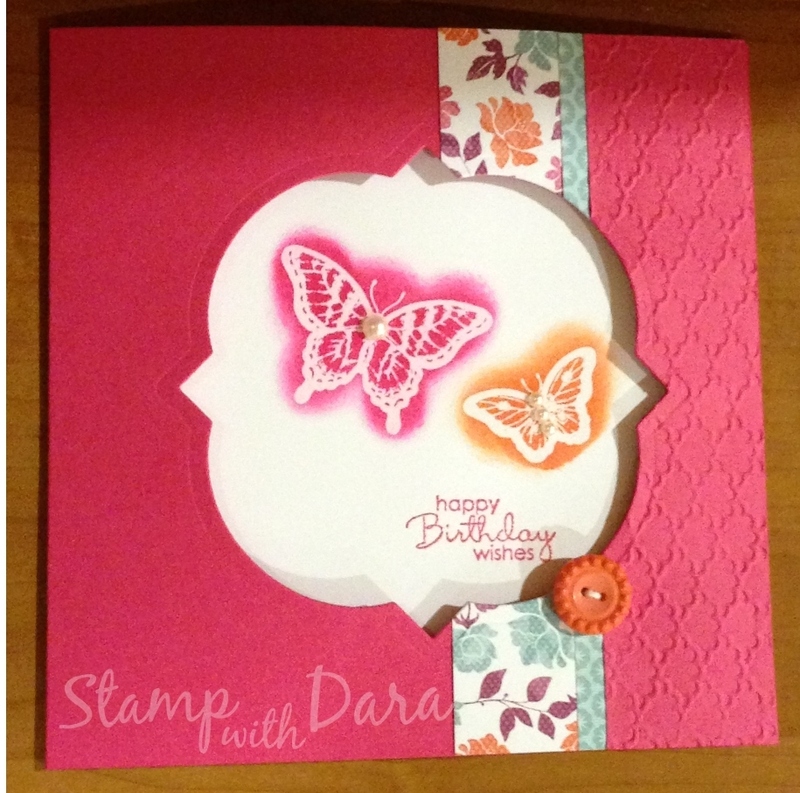 I finished by embossing the greeting in Melon Mambo ink and adding a few pearls to the butterflies. 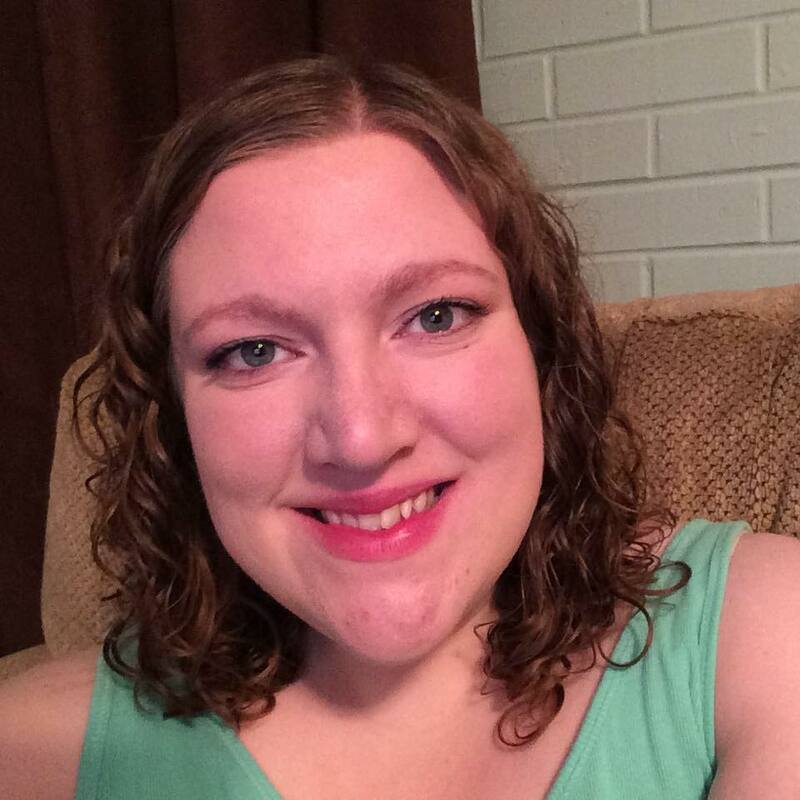 Check out what Elizabeth has to share today by clicking next, and be sure to come back tomorrow for the final day of our blog hop. I saved the best for last. Today I’m sharing a video tutorial for making these cute candy holders! They come together really quickly, and they are so addicting. 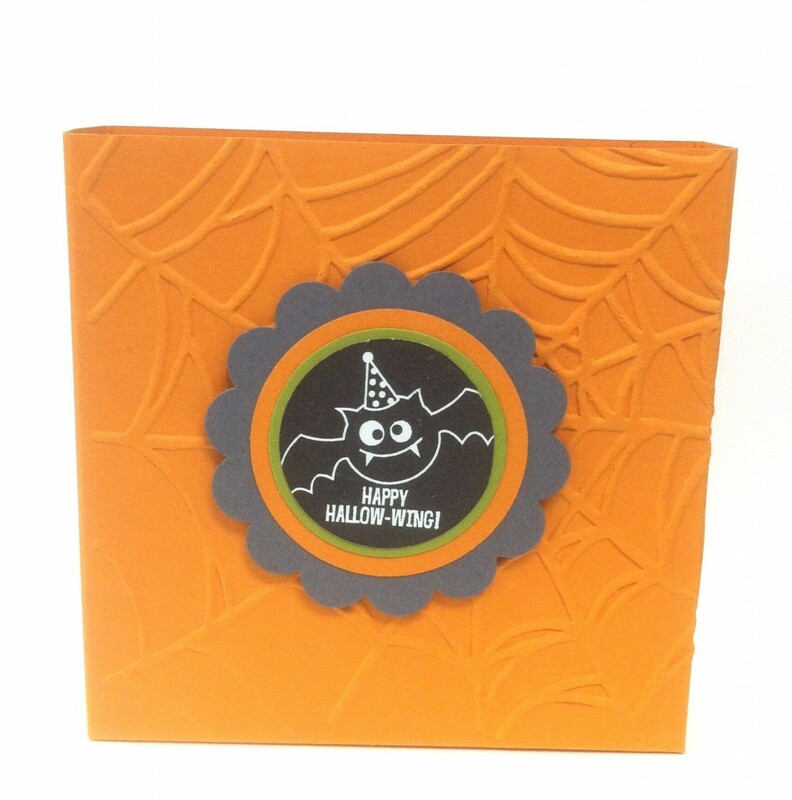 Tomorrow is the last day to receive the Halloween Printer Tray Kit when you sign up as a demonstrator. If you have been thinking about signing up, now is the perfect time. For $99 you will receive $125 of your choice of merchandise. 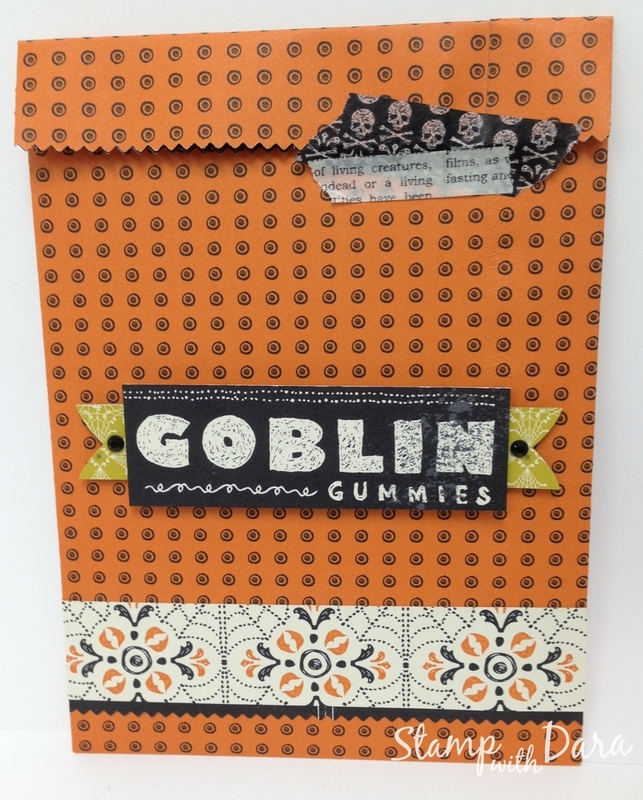 You also will receive everything to make the cute Halloween Printer Tray. 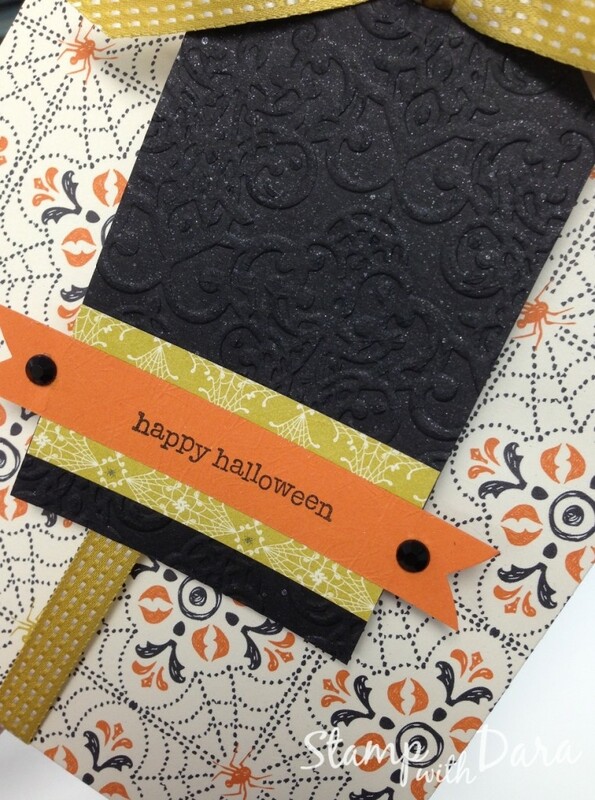 It even includes a stamp set, and you will have lots of leftovers to use on other projects! Sound like something you would be interested in? Click Here to learn more. 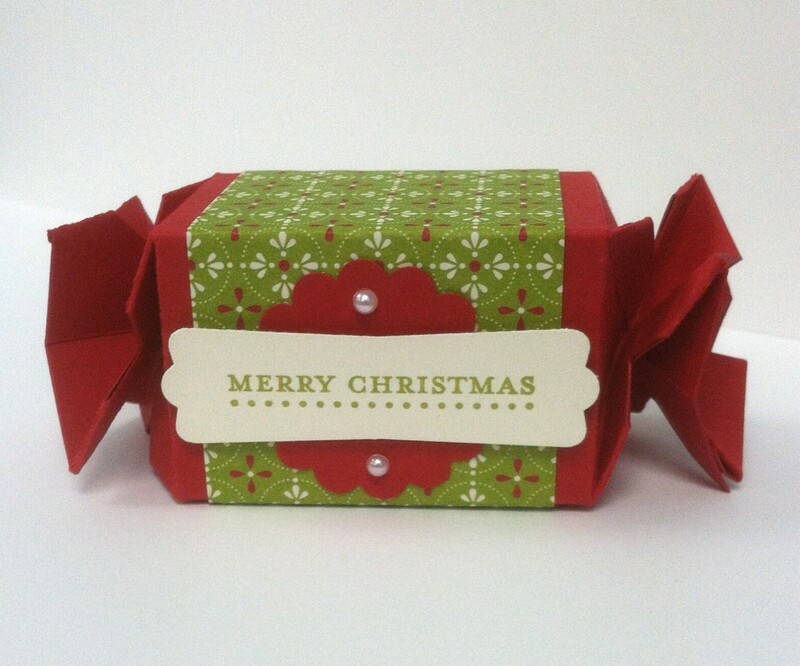 It’s the final day of 12 Days of Christmas, and today I’m sharing a candy wrapper I made using the Candy Wrapper Die. I also used Festival of Prints Designer Series Paper.